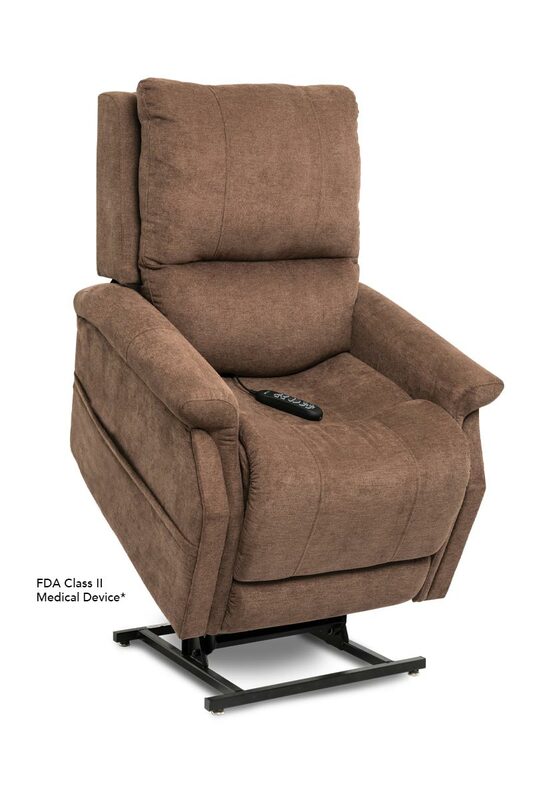 Experience the best in recliner and lift chair performance, all in a modern design with the VivaLift! Metro v.1. Whether you want to sit upright and watch TV or you need to lay flat for maximum relaxation, this model can accommodate your needs and provide fully adjustable and customizable comfort. What helps this lift chair truly stand out is the combination of a full-width power headrest, spring-loaded ottoman and power lumbar support. Every major component of the chair can be adjusted with the push of a button for unbeatable comfort. Perhaps best of all, this stylish recliner features a powerful lift mechanism that will improve your mobility and allow you to enjoy more freedom in your own home. The convenient remote control makes it easy to activate the lift and sit and stand with ease. You will experience smooth and gentle operation every time and with a lithium back-up battery, you never have to worry about going without your chair even in the case of a power outage. Call today to speak with a lift chair expert and learn whether the VivaLift! Metro v.1 is the right model for you. We look forward to hearing from you! Space Needed for Full Recline: 14"